Erreur! You must select at least one ticket to continue. Erreur! Please select a date and time before continuing. 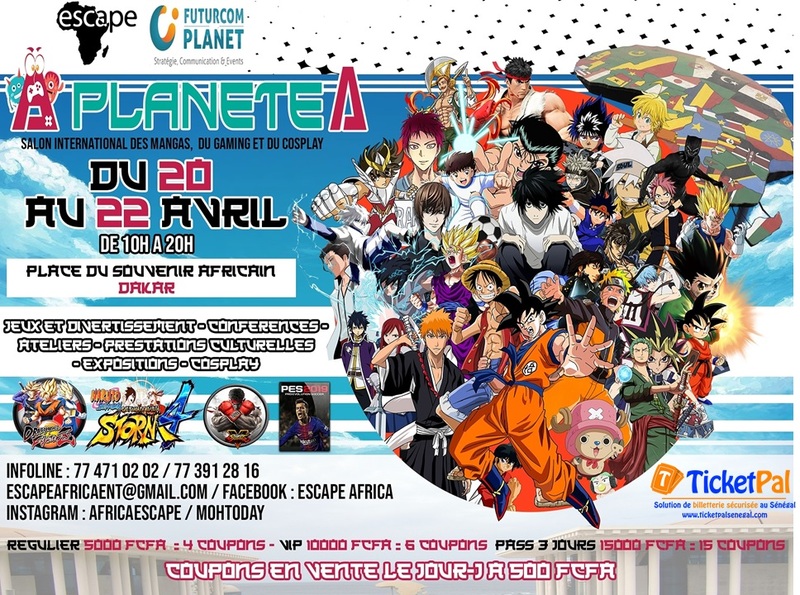 ESCAPE AFRICA ET FUTURCOM PLANET présentent: ☆ ★ PLANET A ★☆ Le festival des MANGAS, du GAMING et des COSPLAY Pour la première fois à Dakar! Du 20 au 22 Avril 2019 à la Place du Souvenir de 10H a 20H Met ton cosplay et viens découvrir l'univers des mangas et du gaming ! Indemnity Any act or failure to act by TicketPal or its agents or subcontractors, you agree to indemnify, defend and hold harmless TicketPal and their officers, directors, owners, partners, partnerships, principals, employees, affiliates and other related entities, servants, agents, representatives, successors and assigns from and against any damages, liabilities, costs and expenses (including reasonable attorneys fees), claims or demands, arising out of (i) your use of or connection to the Website, (ii) your participation in any activities arising from the Website, (iii) your violation of, or failure to perform your obligations under the TOU or, (iv) your violation of any rights of a third party. Termination You agree that TicketPal, in their sole discretion, has the right (but not the obligation) to delete or deactivate your account, block your email or IP address, or otherwise terminate your access to or use of the site (or any part thereof), immediately and without notice, for any reason, including, without limitation, if TicketPal believes that you have acted inconsistently with the letter or spirit of the TOU. TicketPal may also, in their sole discretion and at any time, discontinue providing the Website, or any part thereof, with or without notice. Further, you agree that the TicketPal shall not be liable to you or any third party for any damages resulting from termination of your access to the Website. Copyright and Intellectual Property Rights The content, arrangement and layout of this site, including, but not limited to, the trademarks, photos, text, and computer code are proprietary to TicketPal, either owned or under license, and may not be copied, imitated, reproduced, displayed, distributed, transmitted or otherwise used without the express permission of TicketPal. 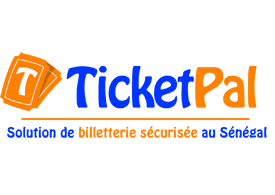 Any unauthorized use of the content, arrangement or layout of the site, computer code, or photos or trademarks found in the site or any derivative works thereof may violate civil or criminal laws, including, but not limited to, copyright and trademark laws, and TicketPal may take action accordingly. Disclaimer of Warranties You expressly understand and agree that your use of the Website is at your sole risk. The Website, or any third party materials, are provided on an as is and as available basis, and you will be solely responsible for any damage to your computer system or loss of data that results from the download, stream or access of any material obtained through the use of the Website. The information provided on the Website written byTicketPal staff is known to be as accurate as possible at the time of writing, and every effort has been made to ensure that the information on this website is as accurate and up-to-date as possible. However, certain information may change, and errors may occur, and TicketPal is not responsible for any loss, financial or otherwise, resulting from changes or errors in information. TicketPal expressly disclaims all warranties of any kind, whether express or implied, including, but not limited to, warranties of title and non-infringement, warranties that the website and any third party materials will be uninterrupted, error-free, accurate, reliable and free from virus and other harmful components, and the implied warranties of merchantability and fitness for a particular purpose. Limitation Of Liability You expressly understand and agree that TicketPal shall not be liable for any direct, indirect, incidental, special, consequential, punitive or exemplary damages, including, but not limited to, damages for loss of profits, goodwill, use, data or other intangible losses, in contract, general civil liability or any other cause of action, relating to the Website or the third party materials. This limitation of liability applies, without limitation, to any damages or injury caused by any error, omission or other failure of performance by TicketPal, their affiliates and business partners; any interruption, defect or delay in operation or transmission, including communication line failure; any computer virus; and any theft, destruction or alteration of, or unauthorized access to or use of, any electronic records. Governing Laws and Jurisdiction Use of the site shall be governed by and construed in accordance with the laws of the Province of Quebec in force at the time without regard to conflict of law provisions. You agree that any legal action or proceeding between you and TicketPal shall be brought exclusively in the courts of the Judicial District of Montreal, Quebec, Canada and/or for TicketPal BB Inc. with the laws of Barbados.